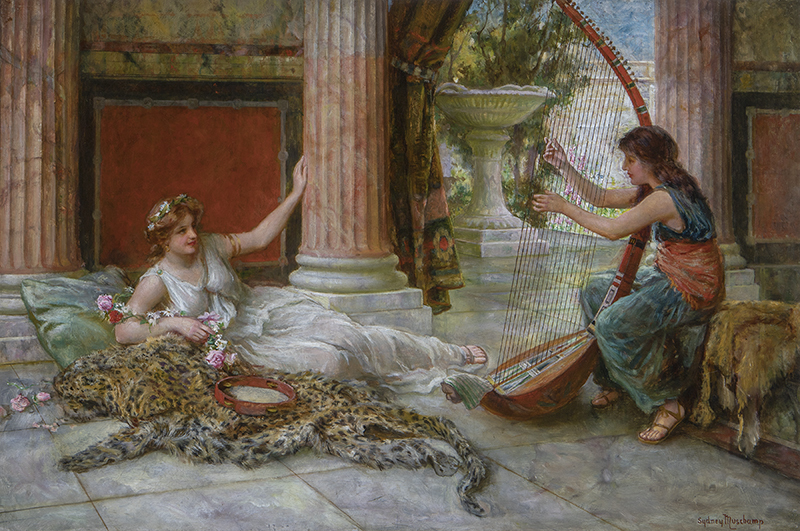 Francis Sydney Muschamp was greatly influenced by Lawrence Alma-Tadema and Lord Leighton, and other leading classical artists of the era. He had a special love for ancient mythology, 19th-century romance, and Elizabethan dramas, as evidence by the titles of his paintings: The Merchant of Venice, The Sonnet, Much Ado about Nothing, Juliet and her Nurse, The Fool and Maria: A Scene for Twelfth Night, The Winning of the Golden Fleece and Ivanhoe. Francis Sydney Muschamp was born in Hull to the son of the landscape painter, Francis Muschamp (active 1865-1881). The family moved to London in 1865, the year that Muschamp Sr. began to exhibit at the Royal Society of British Artists. The younger Muschamp began to exhibit at the Royal Society of British Artists in 1870 and continued to exhibit his paintings at the major halls until 1903. He exhibited at: The Royal Academy (1884-1903); Suffolk Street; Royal Society of Artists, Birmingham; Dudley Gallery & New Dudley Gallery; Walker Art Gallery, Liverpool; Manchester City Gallery; Royal Society of British Artists; Royal Hibernian Academy; and the Royal Institute of Oil Painters. Francis Sydney Muschamp was elected a member of the Royal Society of British Artists (RBA) in 1893.